The Missouri has rainbows and browns. It’s not uncommon to catch several 16-20” fish in a day and perhaps one or two in the 20-24” range. These are strong fish that often frantically leap out of the water. Midges (Diptera) start coming off in early spring followed by Blue Wing Olives (Baetis). Then, in late spring/early summer the river bursts with life. Spotted Sedges (Hydropsyche), Mother’s Day Caddis (Brachycentrus), Pale Morning Duns (Ephemerella), Long Horn Caddis (Oecetis), Hemingway Caddis (Cheumatopsyche), Tricos (Tricorythodes), Brown Drakes (Ephemera Simulans), Speckled Duns (Callibaetis), Hexes (Ephemeridae), and Tiny Blue Wings (Pseudocloen) continually keep the river fascinating. Different hatches for different experiences. The bugs are undeniably prolific. Sometimes the hatches are so thick you have to stop and clean your windshield to see. Its nirvana to the folks who come to try their hand on the Mo. The river fishes year round and every month is different. In winter through early spring; and late fall until the next spring, you have the river pretty much to yourself. Even in the “shoulder” seasons, fishing can be spectacular. 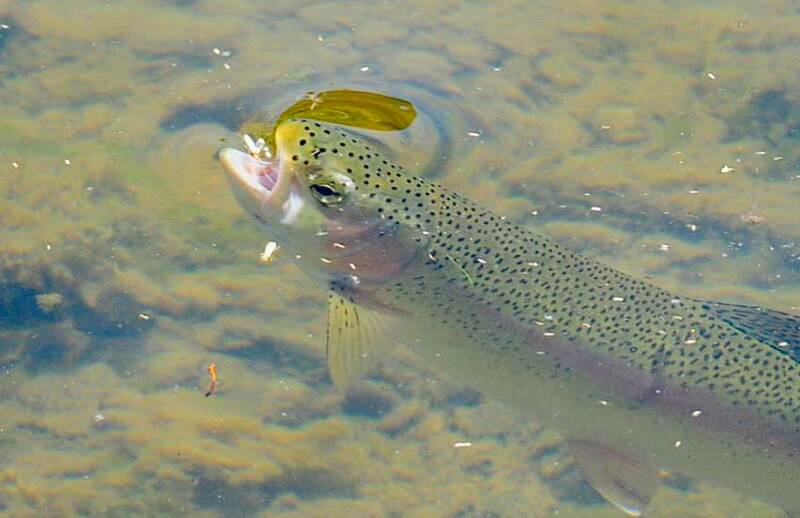 But the truly great dry fly fishing is sandwiched between those seasons. You will find lots of folks here during your stay, but the Missouri is a big river. Even the heat of summer splash and giggle crowd will not be a problem for the angler. There’s plenty of room for everyone.